The expo offers free seminars and workshops on topics such as road safety, auto maintenance, fashion, beauty, parenting, life balance, health and wellness. Other highlights include the Electrolux cooking demo By Chef Bruce Lim, and a Makeover station by BYS cosmetics. Partners including Standard Insurance, Marie France, Brabantia, Garden barn and Tuason Racing School will offer exciting booth demos and workshops during the expo. “We wanted to make an event that will bring together different women’s group and advocacies in one celebration. We want the community to be engaged as active participants and not just passive spectators," explains Jeanette Ipapo-Tuason, author of the Chicdriven and organizer of the expo. “Each seminar represents an advocacy and is co-hosted by a civic or advocacy group such as Zonta Club Alabang, Mommy Mundo, and parent’s associations of the different schools in the south,” she added. In this time and age, women can have it all. They can be mothers, career women, married or single, passionate advocates and decision-makers. Women have become a force to reckon with in predominantly masculine industries including Motoring. Hence the Chicdriven Column was born. It's motoring in women-speak. Cars are not tested on how many cylinders it has but how many strollers it can fit or if its ride is good enough to apply liquid eyeliner while sitting in the passenger seat. Cars have become one of the tools that help Chicdriver¹s achieve “having it all.” Though always trying to strive for the best, this endeavor is not without broken nails or messed up hair. In fact, to be Chicdriven means honoring the struggles and efforts each and every woman goes through to become what she chooses to be -- helping herself to the tools that make it look effortless. Having it all need not be perfect, just chic. 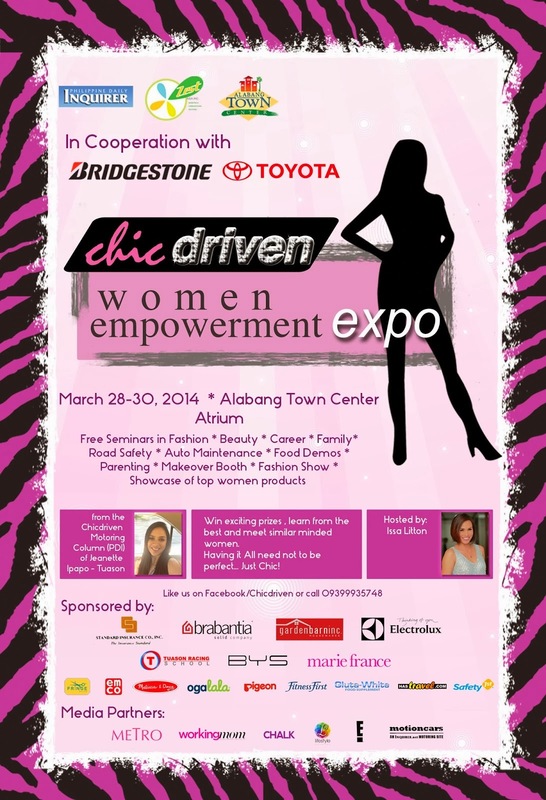 The Chicdriven Women Empowerment Expo will run from March 28-30, 2014 at the Alabang Town Center Atrium and will be open during mall hours. This celebration of women empowerment is supported by Alabang Town Center, Bridgestone Tires, Toyota Motor Philippines. It is made possible through generosity of by Fringe Salon, Fitness First, Melissa and Doug, Ogalala, Safety 1st, Pigeon, and Gluta White, Has Travel.com plus Media Partners that include Metro, Working Mom, Chalk, Lifestyle Chanel, E! and Motioncars.com. For Seminar Schedules, please visit us on Facebook/Chicdriven for updates and promos or inquire at jnt@chicdriven.com.